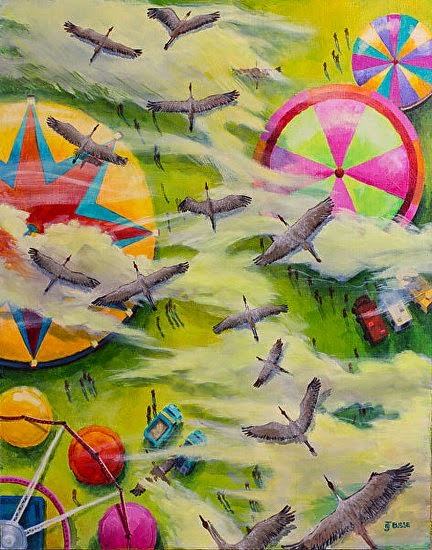 The painting was created for a show with a sandhill crane theme. 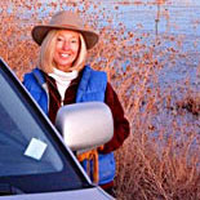 I've painted many realistic images of the sandhills and for this show I allowed myself to create a few fanciful pieces; ones that relied more on my imagination that my photo references. What is it that signals birds to migrate? Most likely the length of daylight signals birds to flock and migrate. But in my flight of fancy I allowed myself to create a world where the birds are beckoned north or south by the activity of the humans who inhabit the planet with them. Maybe it's the sound of a combine, or the smell of freshly harvested crops, or the sound of a school bus chugging up the road. In this painting the cranes watch over us as they fly north to their summer haunts.